As architects, we appreciate great design in all its forms. That’s why we created AutoSpace™ – a building that takes the concept of the garage, and transforms it into a showroom. 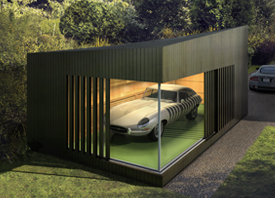 Ambient lighting, floor-to-ceiling glazing or even modular storage systems, you can tailor it, just like your car. And with all natural materials and insulation as standard, it’s where stunning design meets high performance. The perfect match for your pride and joy.